In a recent Forrester report, retail executives predict that digital will drive 58% of their sales by 2020. Another set of executives, this time in the professional service industry, believe that 49% of their revenue will come through digital channels by the same year. What does this mean? Well, it means only one thing: The future of business is digital, and as they always say, the future starts now. Armed with the foresight of digital impact, smart business leaders have moved to embrace low-code platforms, like Joget, to accelerate digital transformation (DX) in their organizations so they can maximize their chances of succeeding. These executives are constantly seeking ways to use digital tools to reshape customer relationships, internal processes, and even business models. For them, it's no more business as usual. To remain competitive and relevant, accelerating digital transformation should be one of your prime goals as a 21st century organization. 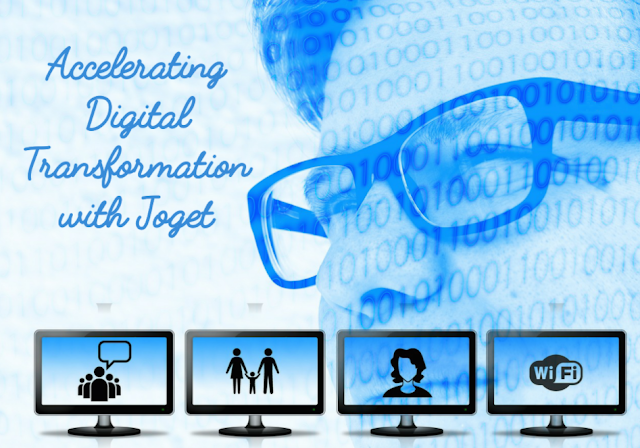 Let's see how you can accelerate your digital transformation journey with Joget. In its best sense, digital transformation means different things to different organizations, thus there's no universal definition of it. However, when rooted in the context of how Joget helps you achieve and accelerate digital transformation, we can define digital transformation as the positive change resulting from the integration of digital technology (Joget) into relevant areas of business with regard to how your organization operates and how you engage your employees with the ultimate aim of delivering value to customers. Along with a keen focus on DX, the Joget low-code development platform offers a simplified and clean interface for easily building and maintaining apps. This speeds up development, minimizes end-user training, and ensures consistency across internal systems so you can easily achieve your digital dreams fast. DX fosters efficient work environments, allowing for innovation, creativity, and better decision-making. It lets organizations automate tasks and workflows, which boosts operational efficiency and saves costs. It reduces error in data management while speeding up the flow of information. It enhances better collaboration among teams and people. It increases productivity and boosts employee morale as they don't have to perform repetitive and monotonous tasks but instead focus on driving value for the organization. Great innovations come into play in terms of how your employees work and meet customer needs. For instance, through digital advances, employees can access information from anywhere and at anytime which enables them to work without limitations. For digital customers who want “fast service”, DX equips your employees to match the speed with which consumers want to be served. Better customer experience (CX) is achieved because when your team works better, they deliver better CX. With Joget, you can achieve these digital benefits plus more. How do you achieve and accelerate DX? From an operational point of view, it’s about planning, designing, building, and deploying leading-edge business apps several times faster. First, determine the digital transformation objectives of your organization. Start with an audit to identify where you currently are in your digital journey and then describe where you're driving the organization to digitally. Whatever your digital objectives are, ensure they align with your organization's overall vision. Map out the journey. Accelerating digital transformation is easier if there is a well-devised strategy at hand. But how do you devise an effective strategy? First, get to understand how Joget works. (For the record, Joget lets you build enterprise web applications that you can use to enhance scads of business processes within your organization.) With this understanding, enumerate in your strategy the types of apps you want to create, how they will be used, and what they'll each do for your organization. Also include how you plan to deploy these apps for successful adoption. Identify digital advocates in the organisation. You need high-level advocates and a digital team. They'll be able to contribute during the planning stage of development. Joget is built in a way that team members can easily work collaboratively to build apps. From the onset, end users/business team members can participate directly in the development as you use Joget to create a working prototype (where users can actually use the system before a full version is developed) and model business processes. To create a prototype with Joget, use the App Generator with which you can generate a fully-functioning prototype from a form. Set up an agile IT operating architecture that allows for incubation of new approaches. With a drag-and-drop functionality, low-code platforms are user-friendly, easy-to-use tools, yet powerful. As a result of its user-friendliness and ease of use, you can easily harness the power of citizen developers, hence better collaboration between business and IT on new innovations. This bridges the gap between business users and development, ensures that app development is aligned with your business goals and that new ideas are incubated successfully. To help you build digital assets even faster, Joget can also integrate with tools like SharePoint and Slack for enhanced collaboration. Build and deploy Joget apps strategically. To accelerate digital transformation, you need the right digital tools to act as the vehicle through which you convey and converge digitization. With Joget, you can build these kinds of digital tools. Joget comes with a plenitude of features and subtools like the Builders, App Generator, and a wide range of plugins for any organization to build and extend Joget Workflow apps. Joget apps can range from a simple database-driven app, to a complex approval process, or even a full-fledged solution (e.g. CRM) which incorporates workflow, data management, and reporting. In our “Coding for Non-Coders” series, we dedicated two complete posts to ‘how to build enterprise apps without any coding’ and ‘how to successfully deploy your apps for adoption’ respectively. Check them out, they'll come in handy here. To succeed in the digital economy, speed is key — customers want to be served fast, employees are demanding for quicker ways to complete tasks, and competitors are not slowing down in their operations either. To be able to meet this need for speed, you need a platform that supports rapid, collaborative app development. This is critical for accelerating digital transformation. Joget combines the speed of low-code development with the advantage of business process automation to put your digital transformation on the fast track, empower citizen developers, fuel quicker business processing, and increase back office efficiency. Evaluate all the digital touchpoints your employees interact with, then use Joget to build a holistic system that accelerates digital transformation.